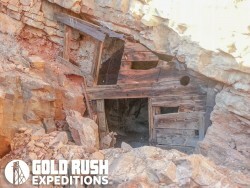 Gold Rush Expeditions, Inc. is proud to present the Black Gold Mine and Mineral Claim. The Black Gold Mine is a 20 acre lode Mining claim for sale exclusively through Gold Rush Expeditions, Inc. The Black Gold Mine is located outside of Bisbee, Arizona and has been properly staked and marked at all corners. The Black Gold Mine has been dormant for an estimated 90 years. There is evidence of some exploratory work and high grading that likely occurred prior to 1980. A series of cuts along a partially exposed fault make up the bulk of the operation. The adits of the Black Gold Mine are all relatively small, 100-200 feet in most cases, targeting a wide body of ore that runs deep into the hillside. Likely an exposed outcrop gave the first evidence of mineralization and work progressed from that point. Extremely rough country. Very close to the Mexico border, security will be a primary concern. The area is heavily patrolled by US Border Patrol. Expect the operator will become good friends with these border patrol agents. This is a gold mine, there are some small flakes of gold that can be seen in the quartz body in some sections of the workings. There is also iron, galena and likely deposits of zinc that have not been explored. The primary value will be in the gold deposits and the development of those deposits. Access is relatively simple but will require high clearance and four-wheel drive is highly recommended as small storms can change the landscape dramatically in a matter of minutes. A good flat at, what is assumed to be, the old mine camp gives a good spot for staging of gear and equipment. Multiple vehicles could be placed here. The Black Gold Mine is an ideal development property that should be considered to be in its infancy. As the lode is defined and mapped, there is excellent potential for expansion and growth. The Black Gold Mine can be developed and sampled as it sits without the need for bonds or notice of Operations. The mine is close to Tuscon for ore processing and also very close to the Mexico border which may offer other options in gold and silver processing. The fundamental rocks of the Bisbee quadrangle are crystalline schist of pre-Cambrian age, separated by a profound nonconformity from the overlying Paleozoic beds. The latter comprise a basal Cambrian quartzite 430 feet in thickness, succeeded by over 4,500 feet of limestone representing portions of Cambrian, Devonian, and Carboniferous time. The Silurian, so far as known, has no lithological representation in the quadrangle. At the close of the Carboniferous period the rocks of ·the Bisbee quadrangle were deformed by faulting and folding, and were cut by intrusions of granitic magma. The principal mineralization of the district probably dates from this time of revolutionary disturbance. The region as a whole was elevated above sea level and subjected to erosion until the beginning of the Cretaceous period. During the Cretaceous the land again sank beneath the sea, and over 4,500 feet of sandstone, shales, and limestone, representing the earlier part of this period, were accumulated. Subsequently, elevation brought these sediments above sea level and exposed them to erosion. The quadrangle contains no rocks of Tertiary age, and there are no known facts from which to determine the exact date of the post-Cretaceous uplift. It was accompanied or followed by faulting and folding. During the Quaternary, and probably during a part of the Tertiary, the higher parts of the Bisbee quadrangle have been undergoing erosion, and have shed their waste into the flat-floored valleys surrounding-the Mule Mountains. Interesting collection of adits and short declines working on a lode deposit that runs at a steep pitch. The adits appear to have been cut as smaller prospects until the lode was intercepted and the size of the vein was defined. Vein is nearly 3' wide in some sections. The body of ore consists of host rock with iron, quartz, galena and some gold. Gold is the primary commodity and there is stoping in some of the workings where the vein opens up. Drifts are solid and stable cut in competent rock. Oxygen levels are at 20.8 and stable with no other abnormal levels detected. It is assumed that most of the drifts are interconnected with winzes or other air shafts as there are good air currents in the larger drifts.